In the AK family of firearms, there are a huge number of different models. The Chinese type 56 rifle is one of these common variants. So how does a person tell that this is a Chinese made AK variant or some other model. This post aims to explain that. First, many Chinese made AKs have markings in Chinese, so if a person is close enough to examine the markings, then this might be a good indication of where it was made. One place to look is near the fire selector lever, which selects the rifle's firing mode. The two Chinese characters are 连 (pronounced as "Lian" and translates as "chain" or "join" or "link successively") and 单 (pronounced as "Dan" and translates as "single" or "only"). These are the equivalents of "automatic" and "single-shot" modes. In the above image, you can see the letters 'L' and 'D' stamped in into the metal. 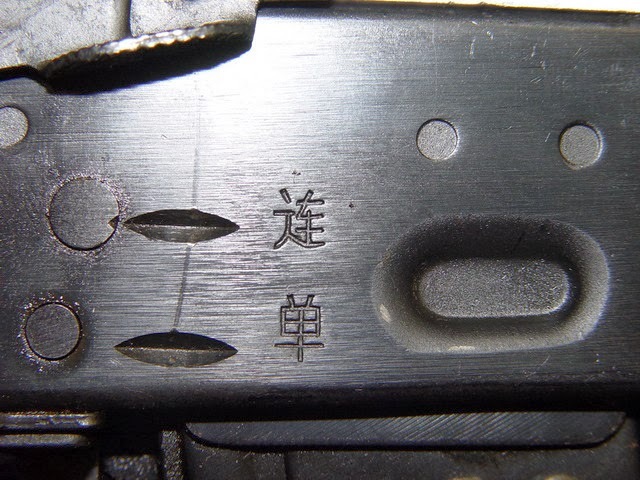 In some Chinese made AKs, there may be other markings in Chinese, or even say "Made in China" in English letters, especially in some imported models. Even without getting close to the firearm, there are other ways to distinguish Chinese made AKs from a distance. As you can see in the image above, the three rivets form a triangular shape. You can see this triangular arrangement in most type-56 models, except some of the early models which had milled receivers. This is also something that is unique to Chinese made AKs only and rifles that are made elsewhere don't have this rivet pattern.